Punkte Benötigt: 39450 Software ist nicht kompatibel mit mobilen Geräten und Tablets. Bitte füge diesen Titel zu deiner Wunschliste hinzu und logge dich auf einem Desktopcomputer in deinen the first club Account ein, um die Einlösung abzuschließen. ABOUT THE SOFTWARE Available Languages: French Russian French German French Spanish French Portuguese French English French Italian Spanish Russian Spanish German Spanish Portuguese Spanish English Spanish Italian English Russian English German English Portuguese English Italian	Specialized dictionaries are designed to support the translation of subject-specific t… exts. 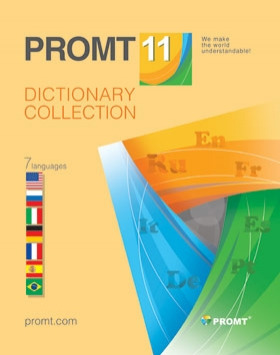 Specialized dictionaries ensure a more precise translation of text containing specialized terminology, providing the correct translation for individual terms and collocations, and contributing to a high quality translation.This Multilingual Dictionaries Collection of specialized dictionaries is intended for use with PROMT 11 applications and supports English to and from: Spanish, French, German, Portuguese and Russian.The Multilingual Dictionaries Collection can be used in the following PROMT 11 programs: PROMT Professional 11 PROMT for MS Office PROMT Home 11 PROMT Expert 11KEY FEATURES	The Multilingual Dictionaries Collection includes the following dictionaries:Finance Accounting and Cost Analysis (English Russian) Financial Services (English Russian) Investments (English Russian) Shareholding (English Russian) Payroll (English Russian) Business Basic (English Russian) Management Corporate Management (English Russian) Human Resources (English Russian) Business Modeling (English Russian) Business Documents (English Russian) Business Basic (English Russian) Economy Economy (English Russian) Investments (English Russian) Trading and Marketing (English Russian) Business Basic (English Russian)Logistics Inventory and Warehousing (English Russian) Transportation (English Russian) Trading and Marketing (English Russian) Business Basic (English Russian)	Business Documentation Business Documents (English Russian) Legal (English Russian) Insurance (English Russian) Business Basic (English Russian) Business Business (English Russian, , English French, English German, English Spanish, English Portuguese) Law Law (English Russian, French English, English German) Politics Politics (English Russian, r-e, English German, Spanish English)Business and Law Business (English German) Law (English German) Hardware Hardware (English Russian) Installation and Maintenance (English Russian) Administering (English Russian) Microchips (English Russian) IT Basic (English Russian) TV and Video (Russian English) Software Software Development (English Russian) Databases (English Russian) Math for IT (English Russian) Administering (English Russian) IT Basic (English Russian) Telecommunications Networking (English Russian) Telephony (English Russian) Signaling (English Russian) Physics for IT (English Russian) Hardware (English Russian) IT Basic (English Russian) Computer ComputerMsdn (English Russian, English French, English German, English Spanish, English > Portuguese) Private Letters Private Letters (English Russian, English French, English German, English Spanish, English Portuguese, Italian > English) SMS (English Russian, English German) Links (Italian > English) Internet Internet (English French, English German, English Spanish)Hobbies Travel (English Russian, French English, English German, English > Portuguese) Cinema and Mass Media (English Russian, English German) Music (English Russian, English German) Religion (English Russian, English German) Perfumery and Cosmetics (English Russian) Culinary (English Russian) Sport (English Russian) Phrase Book (Russian > English) Advertising (French English) Arts (English German) Sport Sport (English French, English German) Phrase book Phrase book (English German)Cinema Cinema (English German)Arts Arts (English German) Culinary Culinary (English German, French English) Football Football (English German, Spanish > English, English Portuguese) Home Appliances Home Appliances (English German)	Transport Railway (English Russian) Aviation (English Russian) Navy (English Russian) Shipments and Dispatching (English Russian) Advertising Advertising (French English) Travel Travel (French English, English German, English Spanish) Music Music (English German) Space Space Industry (English Russian) Military (English Russian) Religion Religion (English German) Power Engineering Power Engineering (English Russian) Electrical Engineering (English Russian) Equipment Installation and Setup (English Russian) General Engineering Politechnical (English Russian) Automotive Automotive (English Russian, English German) Oil and Gas Oil and Gas Exploration Industry (English Russian) Oilfield Technology (English Russian) Mine-Technical (English Russian) Chemistry (English Russian)	Mechanical Engineering Mechanical Engineering (English Russian) AutoEngineering (English Russian) Cable Industry (English Russian) Metallurgy (English Russian)	Light Industry Textile Industry (English Russian) Cosmetic Industry (English Russian) Food Industry (English Russian) Agriculture (English Russian) Timber Industry (English Russian) Building Building (English Russian) Publishing Publishing (English Russian) Engineering Engineering (French English, English German) Physics Physics (English Russian) Electrophysics (English Russian) Physics of Signals (English Russian) Natural Science Chemistry (English Russian) Biology (English Russian) Medicine Medicine (English Russian, French English, English German) Ecology Ecology (English Russian) Sociology Sociology (English German) History History (English German) Mathematics Mathematics (English Russian) SYSTEM REQUIREMENTS	One of the following PROMT 11 programs should be installed on the system: PROMT Professional 11 PROMT for MS Office PROMT Home 11 PROMT Expert 11	500 MHz Pentium processor or better	At least 64 MB of RAM SVGA or better video card and monitor	Operating system: Microsoft Windows 10 Microsoft Windows 8 Microsoft Windows 7 Microsoft Windows Vista Microsoft Windows XP Professional with Service Pack 2 or higher NET Framework 3.0 (installed automatically)Plug-ins with translation capabilities are supported for the following third-party applications: Microsoft Office XP-2013 (only 32-bit versions) OpenOffice.org Writer v2-3.2 Microsoft Internet Explorer v8-11 Mozilla Firefox v24	© PROMT, 2003 - 2016 . All rights reserved.